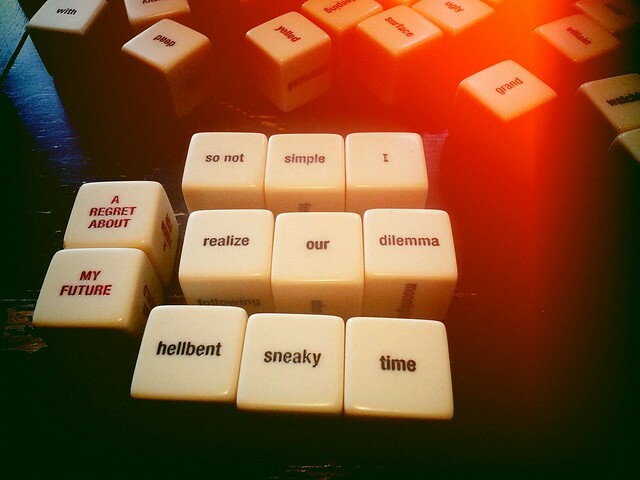 These haikubes were a birthday present from my cousin. The idea is you roll out all the many-worded cubes, then create a haiku on the theme suggested by the prompt. In order to keep it interesting and not torture myself I don’t spend too long coming up with each one, but I do try to stick to the prompt and the correct form (five syllables in the first line, seven in the second, five again in the third). I don’t think that I could tell myself to sit down and write a poem, but I can tell myself to play with these. I suspect it’s good for my brain, and is another exercise in paying attention. I’m going to collect pictures of the haiku in this flickr set.